For most of yesterday buyers outside the United States could place orders for Google's Chromecast streaming dongle through Amazon.com, in a way that's usually not possible for consumer electronics on the U.S.-based site. The opening allowed international buyers to get hold of a Chromecast before it's officially available in their country, and often for less than the high prices found on eBay and elsewhere. Today, though, Amazon has closed that particular loophole, and attempting to select a non-U.S. shipping address for your Chromecast order produces the error message above. On the upside, orders placed yesterday from outside the U.S. seem to be shipping (we've already received our dispatch notification), so quick-witted international customers should still get their devices in the days ahead. 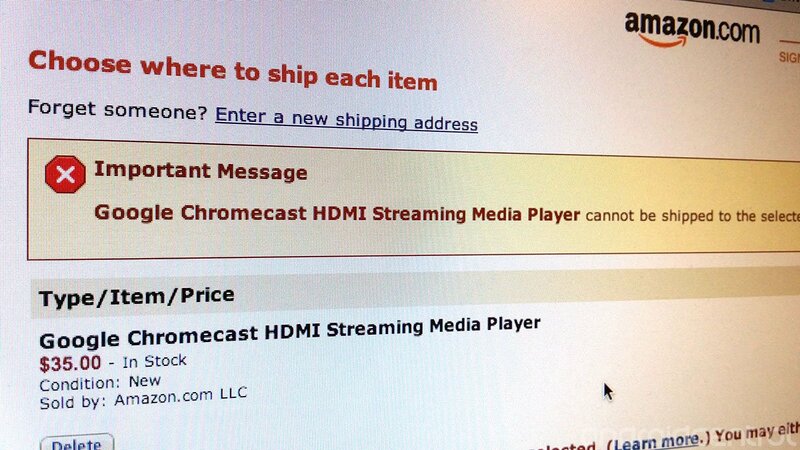 U.S. buyers can continue to order Chromecast through Amazon.com, as well as the Google Play Store.